The event, hosted by Jimmy Kimmel, will take place in Los Angeles on January 16. The Foo Fighters, Metallica and Ryan Adams will be among the musicians that will gather for a special tribute performance to late Soundgarden frontman Chris Cornell. The event, titled “I Am the Highway: A Tribute to Chris Cornell,” will take place at the Forum in Los Angeles on January 16. 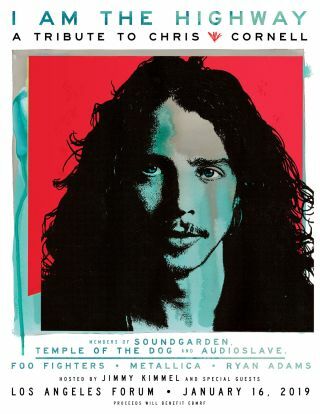 Also included on the star-studded bill will be members of Cornell’s bands Soundgarden, Audioslave and Temple of the Dog. The event will be hosted by Jimmy Kimmel and will feature other surprise guests. Tickets will go on sale on Friday, November 16 at 10 A.M. PST here. “We are honored to have all these amazing artists and friends come together to pay tribute to and show their love and appreciation for Chris, his music and the mark he’s left on the world. We look forward to sharing this night with all the fans,” said Chris’ wife, Vicky Cornell. In keeping with Chris’ vision to protect the world’s most vulnerable children, the evening will benefit the Chris and Vicky Cornell Foundation (chrisandvickycornellfoundation.org/) as well as The Epidermolysis Bullosa Medical Research Foundation (www.ebmrf.org), a nonprofit dedicated to raising funds and awareness for this painful and debilitating genetic disorder, a very personal cause that Chris cared deeply about and supported through his commitment to helping others. As previously reported, a new career-spanning Chris Cornell album will be released on November 16. The self-titled effort features unreleased studio and live material, and will be available as a 17-track album and a 64-track limited-edition deluxe box set. You can check out full Chris Cornell details and track listing here, and preorder the album here.